We received a distraught message from Louise Levin, the landlord of three retail spaces along West 3rd Street, including Wonderful Cuts at 8040. She was alerted to the tip we posted yesterday in which someone claimed the salon was leaving due to mold. 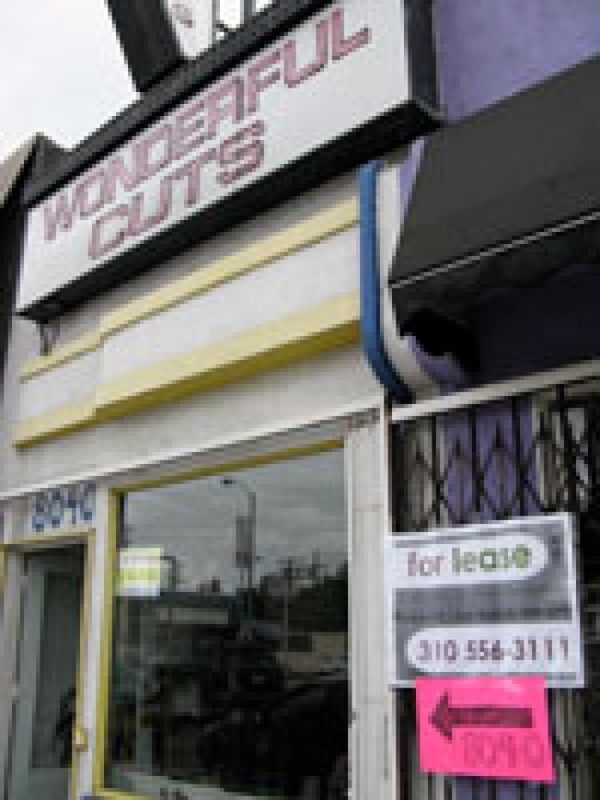 Levin told Racked that Wonderful Cuts has been in the 800-square-foot space for 18 years and it is not mold that's edging out the salon but increased rents; Levin was going to raise the rent from $2,200 a month (a steal on the street) to $3,000 a month when the shop's lease is up October 31. The salon could not keep up with the rent hike so decided to leave at the end of the month. She contacted us to uphold the integrity of her real estate and duties as a landlord: "As soon as there was a complaint, I always came in to fix it." She also told Racked that Wonderful Cuts owner Vivian kept taking the 'for lease' sign down from the storefront window and that's why she posted a sign off to the side (though a 'for lease' sign was up a few days ago in the window). Levin also noted that the shop sells plants and recently brought in a manicurist without consulting her. Clearly, the situation has gotten a little sticky, but Levin wants people to hear her side and let potential tenants know it's a "lovely store." Likely, the $3,000 a month rate won't apply to the next tenant (Levin was giving the salon a deal for being such a long-time tenant), but she is willing to negotiate. If interested, call the number on the sign: (310) 556-3111.